This article is not going to focus on the biography and background of the artist but more on the actual painting. First of I will explain my reasons for choosing this painting in particular. Why do I find this painting to be different from other Vermeer’s works? First of all what really caught my attention was the character itself. The character of the lacemaker is a sweet, gentle character that transmits calmness and tranquility. The kind of painting that I would like to hang from the wall of my living room. Another thing that I like about this work is that the painting is centered just on the girl, there is nothing in the background to distract us from the centre of attention. 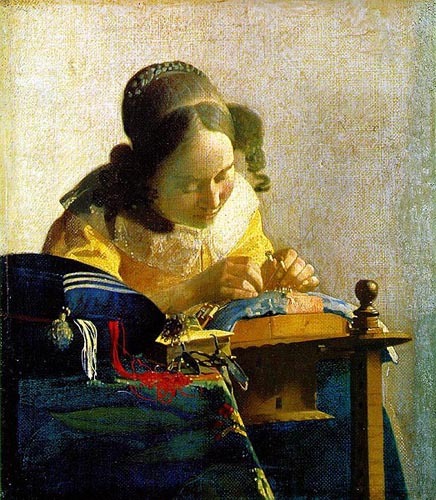 Unlike other Vermeer paintings such as Girl reading a letter at an open window or The Milkmaid, in the room of the lacemaker there are no paintings or world maps hanging from the wall. Some questions that often arise when we look at this painting are related to the art of lace making. In what exactly did it consist of the work of lace making?, Was it very popular in that period of time? In these lines it will be explained very briefly the importance of the lacemaking in history in order to understand this painting better. Lacemaking was in fact one of the greatest extravagances in the history of clothing. It wasn’t until the 15th century that True lace was first made. According to some experts, True lace is the kind of lace we find in the Lacemaker, and in the picture above where it can be appreciated in more detail. All laces were handmade and very expensive and they were made from many fibers such as cotton, silk and flax. We can distinguish two ways of making laces: bobbin lace and needle lace. In the bobbin lace the threads are plaited and twisted, and this is what the girl from the painting is doing when she was portrayed. Bobbin lace became more popular than needle lace because it was lighter in texture and it worked well in Elizabethan costume. This article has focused on different details of the painting. First of all we have the cushion. This kind of cushion was often decorated with tassels and it’s called naaikussen in Dutch, which means sewing cushion. It was a familiar object anywhere in the 17th century in Netherlands. It was usually covered with velvet or cloth. In this case, and also in my opinion, the cushion was covered in velvet because of the shiny blue in which it has been painted. Inside the cushion there were a number of compartments which served to keep the accessories necessary for sewing. 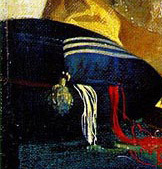 As we can find in Vermeer’s work, threads of different colours come out of the opening of the cushion. Let’s move on to the detail of the Bible now. According to some critics, the book that the lacemaker has on top of the table could be a small Bible or a prayer book. I imagine that it was in the routine of the lacemakers to read some passages before or after the lacemaking and then use it to rest the threads. At the same time, the Bible symbolizes domestic virtue which was a fundamental concept in Dutch civil life. It was a matter of culture, the believe that women belonged in their homes, doing needlework, taking care of the household, and looking after the children. Coming back to the element of the laces, if we take a closer look at the girl’s hands we cannot see the lace that she is actually making. 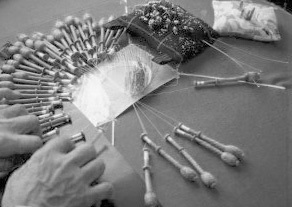 On the other hand, we can appreciate the detail of the bobbins and the pins so if we take into account what has been said earlier in this article, we can come to the conclusion that she is doing bobbin lace. Some other elements that appear next to her hands are the lacemaking pillow and the pricking card. The lacemaking pillow was used to make shorter pieces of laces or stripes of lace. The pricking card on the other hand, was placed on top of the cushion and was used to follow a certain pattern. To conclude this article and just as a curiosity, an tribute to Vermmer’s lacemaker by the English artist Rusty Woodward Gladdish has been found on the internet. Although she has given a much modern style to the painting by using colours of the same scale, she respects the original painting very well. In conclusion I would like to pose a question to the readers, who is the girl from the painting? 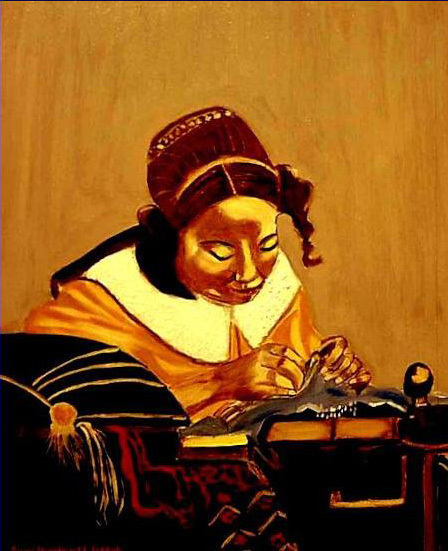 Some critics argue that she could be Vermeer’s wife because of the elaborate hairstyle and expensive clothes that contrast with the clothing of the maids who appear in other paintings. However this is just another theory that tries to clear up one of many mysteries of the genius of an artist, Johannes Vermeer. Good research on bobbin lace. Thank you. I have a copy of this painting that my grandmother purchased in a thrift shop in England in the 1960’s. I is so close you have to study it to be sure it isn’t the real thing right down to the signature. I wonder about it’s value for insurance purposes.